My Autistic Son is a Leader. And He’s Taught Me A Few Things. Each leader brings personal experiences into the workplace and uses the tools of life to solve problems and further one’s career. We cannot avoid it; we cannot turn off one part of our lives if we are to live authentically. As multi-dimensional humans, we draw from what we know and ideally select the best of our journey to inform how we operate with integrity and expertise. One of the experiences that has had the most profound impact of my life has been raising a son with autism who will need lifelong support. Rather than distracting me from my career, Liam’s journey has embedded in me some deep awareness of how I need to respond to people around me to elevate our mutual goals. He is a true success story, and I owe much of my own success to his teaching. 1. Be curious, not furious. It is time to get curious, not furious. There were often times in my son’s life when he did not have strong language skills and his behavior was difficult to manage. Over time, we realized his behavior was his communication, and if we got very curious about what he was trying to say to us and listened very loudly, we could bridge the gap of our mutual misunderstanding. Over time, he learned to trust that we were listening and gained confidence to find more effective ways to communicate that did not involve challenging behaviors to get our attention. And we learned to get curious before getting furious. Curiosity allows us to assess how to transform an error or misunderstanding into a teachable moment, correct our course and replace hope with collaboration on a successful outcome. I find too few leaders see their roles as coach and miss the opportunity to shepherd their teams to greatness. I am often baffled when I ask leaders about what motivates their individual team members and they don’t know the answer. If that is so, how can you help lead them to achieve their dreams? That is the job of the great leader – we are there to serve our people to reach their goals. Of course they are also there to do the job we pay them to do, but each of us comes to work to uncover how our purpose and passion lies in that job description. The great boss connects those dots. There is a direct correlation between coaching and employee engagement. Good managers are not necessarily great coaches, and it is important to know which you are. 2. The dignity of risk. This is a term in the disability world that suggests that individuals need to be given the dignity to make decisions – and even mistakes – and not be so protected as to limit the quality of their life experience. As leaders, our role demands we allow others to take sensible risks, make mistakes and learn from them without the fear of fatal consequences. “Good leaders make you feel safe,” as Simon Sinek shares in his TED talk. Innovation is impossible without an element of “safe” risk taking. By definition new, fresh ideas can only be explored within the allowance of failure. Future leaders need a runway to explore their ideas and practice their skills with the confidence they will not be thrown away for falling short. I have seen over and over again when a professional reaches a point in their career and is expected to know how to do certain things (like business development or effective management skills) without having had guidance or practice. It is as if by osmosis the Senior Manager is meant to wake up the day after promotion and know how to be the next Partner. Of course it does not happen that way. As leaders, we help chart the path by providing experiences, challenges and feedback. That last word is critical: feedback. Too often we resist the chance to complete the cycle of risk with reflection on what worked and what did not. 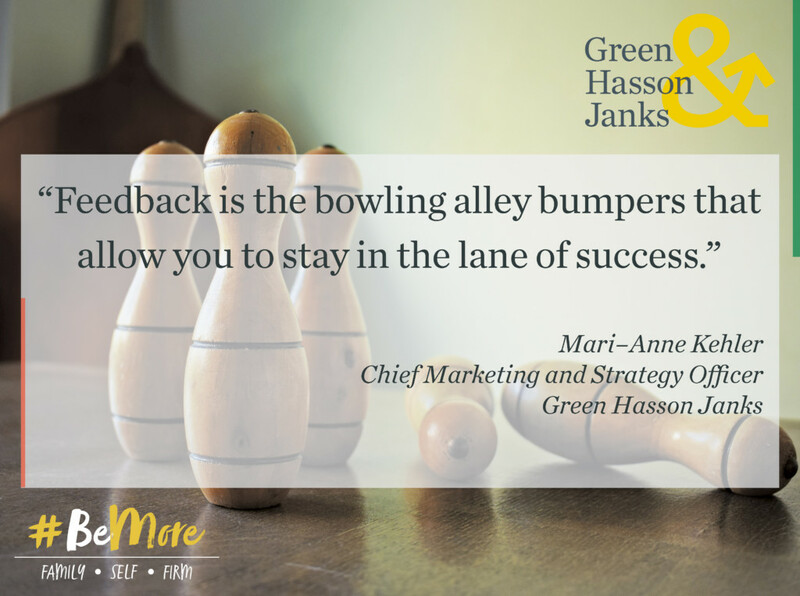 Feedback is the bowling alley bumpers that allow you to stay in the lane of success. If we ask someone to take a risk, we owe him or her the coaching on how they did – both good and bad – without consequence, followed by encouragement to try again. 3. Every human has a superpower. Similar to knowing your team members’ motivations, it is important to know each person’s superpower. They have at least one. Over time we discovered our son would be successful in life because he is kind, charming, stubborn and tenacious. The first two are important, because likability is proven to be an ingredient for future success for all of us. The last two serve him because he will not give up until he has achieved what he has set out to do. On any team, Liam emerges as a leader and an asset. Similarly, each member of your team brings his or her superpower. Often each person has more than one. Know what they are. And more importantly, make sure they know what their greatest strengths are. Why? Gallup analysis reveals that people who use their strengths every day are three times more likely to report having an excellent quality of life, six times more likely to be engaged at work, 8 percent more productive and 15 percent less likely to quit their jobs. Being a curious coach pays off. Parenting is tough. Some might say the toughest job you’ll ever love. Those skills of coaching, encouraging risk and nurturing strengths transcend parenting and lead us into effective leadership roles when harnessed properly. Our kids become the teacher when we open to the lessons we’ve learned, and are willing to share what we’ve learned with the same passion and purpose as we do at home.